– in der Politik (politische Rechte)? – im Privatleben und im Haus (Ehe, Gynaikon, Symposium)? In what ways was a woman’s social life restricted? What tasks and duties did women have (as wives)? Wie sah das Alltagsleben (v.a. 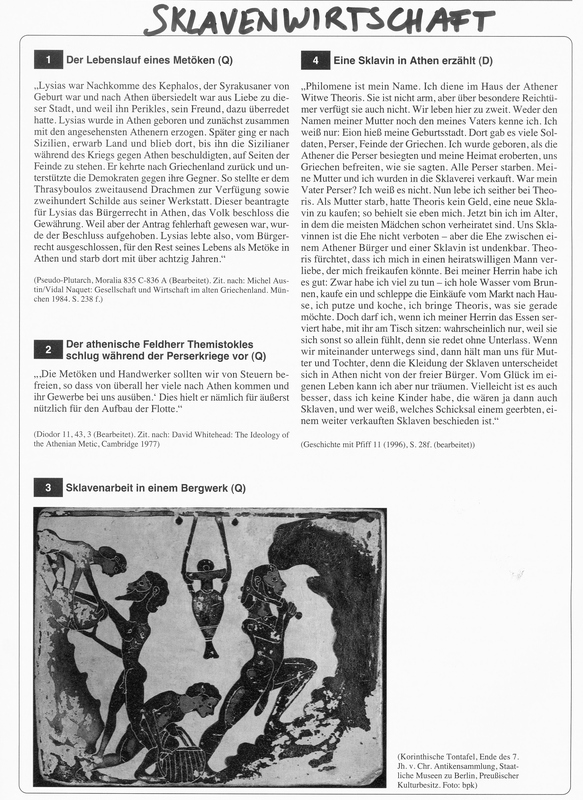 für Kinder) in der Antike aus? Wie kleideten sich die Menschen, was aßen sie, welche Feste feierten sie? What differences were there in the upbringing of boys and girls? What was it like growing up in Ancient Rome? What did pupils learn at school? What games did children play? Welches Ansehen hatte Arbeit im antiken Griechenland und im alten Rom? Wie wurde man/frau Sklave/Sklavin? How did the Romans obtain their slaves? What types of jobs did slaves have to do? Was wurde in der Landwirtschaft im antiken Griechenland und im antiken Rom produziert? What forms of resistance were there among Roman slaves? 1. What does the term polis mean? What did an ancient Greek polis look like? The fortified area of high ground was called acropolis, where a temple dedicated to the city’s patron deity (= Schutzgott) was (Example Athens: Pallas Athene). In the centre of the city, which was surrounded by a city-wall, there was an agora used for markets and meetings. 2. What does the term politics ( = Politik) mean? • Politics refers to making decisions about the affairs of a community: How we set up rules (= laws) in a community of people with regard to economy, buildings, paying taxes, war, etc. • The questions are: Who has the power to implement laws? Who has political rights? Who has a say? Until 700 BC Greek city-states were ruled by Kings. This form of government is called monarchy (= Königsherrschaft) meaning “one person rules”. Kings lost their power to the land owning aristocrats who had received land as a reward for fighting wars for the kings. Aristocracy (Adelsherrschaft) means government of “the best”. During times of political unrest it happened that one man took over power and ruled absolutely. This sort of leader was called a tyrant (= Tyrann). Around 600 BC: Rich land-owners became richer whereas small farmers and ordinary citizens became ever poorer. Many of these small farmers (Kleinbauern) had high levels of debt (hohe Schulden) and were forced to sell their farms. Some became debt bonds (= slaves) of the rich land-owners or were sold into slavery abroad. This led to a social conflict between the poor farmers and the rich landowners, which threatened to turn violent. Debts were cancelled (Schulden wurden gestrichen), citizens could no longer be sold into slavery. Limitations on the amount of land the nobility (= Adel) could own. 7. Passing laws in Ancient Athens: How did the Assembly (= Volksversammlung) work? How did the Council (= Rat) work? 8. Who were the strategoi (Strategen)? How did the strategist Pericles (Stratege Perikles) change the political system in Athens? Officials (councillors/Räte, jurors/Geschworene) and even citizens who attended the Assembly were paid a wage that poor ordinary Athenian citizens could afford to take part in political life. 9. The legal system: How did a trial (= Gerichtsverfahren) look like in Athens? How did Athenians try to make their courts (= Gerichte) unbiased (= unparteiisch)? What were the tasks of the jurors (= Geschworene)?